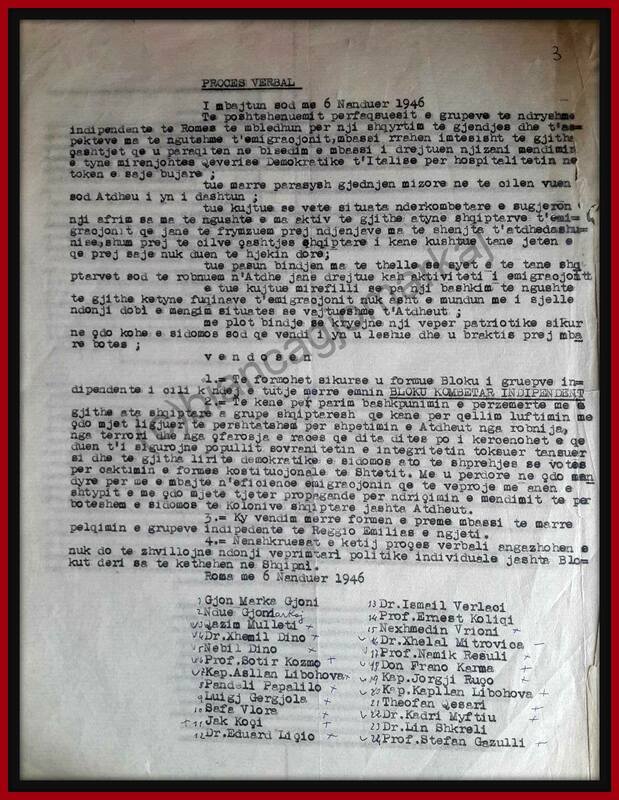 After Gjon Markagjoni and his son Ndue reached Rome they began contemplating on a way to unite Albanian nationalists and anti-communist forces who were forced to escape their motherland. Bloku Kombetar Independent was the fruit of these endeavors and was created in 1946. The party was joined by many notable figures of Albania all of whom wanted to be part of the fight for a free Albania and fulfill their lifelong dream; to see their families once again in a free and democratic Albania! The history of the Bloku is a long and an important one. After 9 years of existence it joined the restructured National Committee for a Free Albania (NCFA) in 1955. This Committee was created as an overt operation to assist in the US and British led covert operations which would be launched between 1948-1953 in an attempt to free Albania and topple the communist regime. In order to better show the functionality of the Committees, insight into its members and their important presence in the fight for a free Albania I am posting various personal documents and copies of documents available through the CIA (Central Intelligence Agency) site. These CIA documents have all been declassified and released under the Freedom of Information Act. In the CIA Report dated 15 Sep 1949: “Aims and Purposes of the BKI”, CIA-RDP82-00457R00320014CIA-RDP82-00457R003200140008-0-1949, it recognizes some very important qualities of the party. The CIA reports are also very important to the historical legacy of my family. It shows that even the government of the United States of America recognized the valuable contributions made by my family, not only in the fight against Communism but also in their indisputable place in Albanian history. It validates the family’s honor, commitment and love for Albania on many, many levels, a fact which the communist regime, for over 50 years, tried to destroy through their propaganda and teachings. A fact, which to this day, is still disputed among scholars and so called intellectuals in Albania. CIA-RDP82-00457R012000090005-8-1-Bloku Kombetare List 1952 – List of Albanians living in Yugoslavia who applied for membership in BKI in 1952.